We are always getting asked by our clients, ‘do people actually click on the Google Ads because I always ignore them’. The short answer is YES! Clicks on paid search actually beat organic clicks by almost 50%, especially those with high commercial intent keywords. Sources say that over 64% of people click on Google Ads when they are looking for something online, making it crucial you have a presence in this arena. Due to over 45% of people not being able to identify paid ads on a search results page, especially since the right hand column has been removed, people are simply clicking on the first thing they see in the search results. PPC has been taking over more and more of Google’s first fold of the page. As you can see from the screen shot below, out of 14 spaces, paid search has been allocated 12 of these. 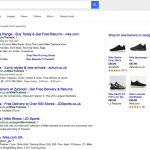 Therefore, all retailers need to be utilizing both Google Shopping and Google’s text ads. However, it is important to remember that organic searches still get more clicks overall than paid search as not all keyword searches are created equal. Peaky Digital create keyword strategies, integrating both PPC and SEO to ensure you’re utilizing both channels to their full potential. 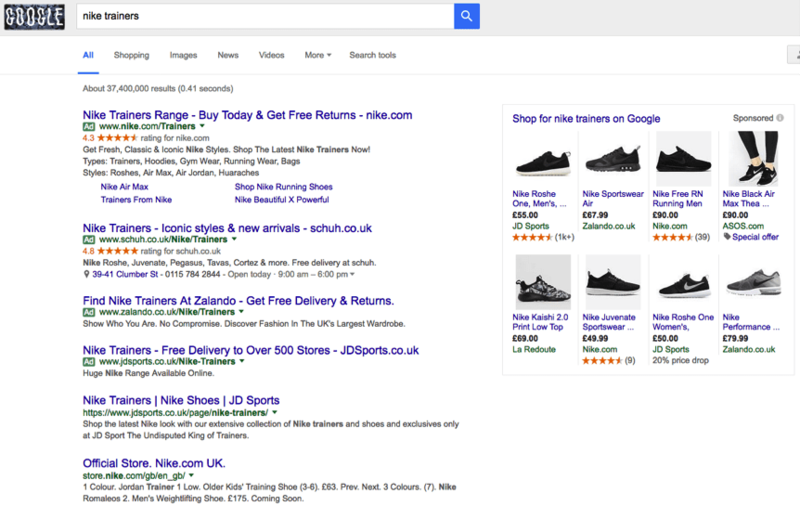 Often we will recommend using paid search for high commercial intent for example, ‘buy nike air trainers’ and using SEO to rank for informational keywords such as ‘reviews for nike air trainers’. So what’s making organic ads less visible?